In the early 1960s, an assembly of choreographers, visual artists, composers, and filmmakers made use of a church in New York’s Greenwich Village to present performances that redefined the kinds of movement that could be understood as dance—performances that Village Voice critic Jill Johnston would declare the most exciting in a generation. The group was Judson Dance Theater, its name borrowed from Judson Memorial Church, the socially engaged Protestant congregation that hosted the dancers’ open workshops. The Judson artists emphasized new compositional methods meant to strip dance of its theatrical conventions and foregrounded “ordinary” movements—gestures more likely to be seen on the street or at home. 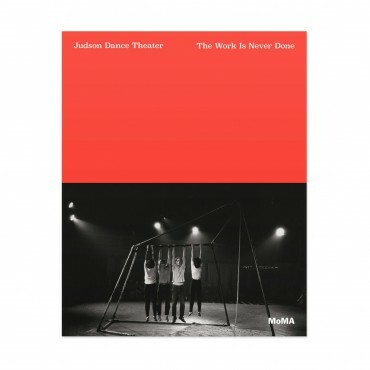 Although Judson Dance Theater would last only a few years, the artists affiliated with it, including Trisha Brown, Lucinda Childs, Philip Corner, Bill Dixon, Judith Dunn, Ruth Emerson, David Gordon, Alex Hay, Deborah Hay, Fred Herko, Robert Morris, Steve Paxton, Rudy Perez, Yvonne Rainer, Robert Rauschenberg, Carolee Schneemann, and Elaine Summers, would challenge choreographic conventions and profoundly shape art making across various fields for decades to come. Judson Dance Theater: The Work Is Never Done includes newly commissioned essays that highlight the history of Judson Dance Theater and its legacy in our own time. Published in conjunction with an exhibition at The Museum of Modern Art, New York, this lushly illustrated volume charts the development of Judson through photographs, film stills, choreographic scores, architectural drawings, and other archival materials, as it celebrates the group’s multidisciplinary and collaborative ethos and its reverberant achievements.